There’s no piece of tech I’d rather own right now than a Tesla. Yes it’s an enormously cool car, but there’s also the fact that you're buying something that’s not only fun, but is also helping to save the planet by making electric vehicles mainstream. However, living in central London means that it’s almost impossible to justify owning a car in the first place, let alone one as pricey as a Tesla. So when Soco got in contact asking if I’d like to test out their new electric motorbike, the Super Soco TS1200R, I leapt at the chance. Here was a way for me to have the same fun and freedom as I currently get from my scooter (a 2014 125cc Vespa Primavera) without the environmental guilt, and with the advantage of never having to fill up with petrol ever again. Like every electric vehicle, the Super Soco needs to be charged before you can use it. However unlike the likes of Tesla, which you’ll need to plug directly into a charging station, the Soco is equipped with a removable battery which means that you can park it absolutely anywhere while you charge its battery in your home or office. Not only is this convenient, but it also means that your bike is a lot harder to steal if it’s sitting out in the road without a battery. Naturally this might one day change if these bikes end up becoming more popular, but for the time being at least it should work as a pretty effective anti-theft device. It also charges surprisingly quickly. On the day I received the bike the journey to the TechRadar offices had taken its charge level close to zero, and so I was able to test how long it would take to completely charge. Total charge time? 5 hours. Not exactly instantaneous, but it should easily charge throughout the course of the working day, not to mention overnight. Here’s the thing though, a battery that’s capable of offering 25 miles of range* is heavy. I was able to lug the battery from my various parking spaces to both the office and to my apartment, but if I had to park further away on a regular basis then I’d start to seriously resent both the battery’s weight and size. Get the battery reconnected to the bike (which feels like a bit of a DIY experience given that you have to flip a fuse switch in the process), and you’re good to go. Turning the bike on rewards you with a MacBook-style booting-honk (that’s a startup sound for all you non-wordsmiths out there), at which point the bike’s central display turns on and gives you details about the bike’s battery life, its engine temperature, and your speed. At this point the bike was as silent as when it was turned off completely, so I naturally assumed that it was still in a ‘Standby’ state, ready to be awoken by...something. To get an idea of how the bike felt I gave the throttle a twist, and to my complete surprise glided out into the middle of the road. At this point I was thankful for a couple of things; firstly that there were no cars coming, and secondly that I’d already put all my safety gear on before ‘testing’ the bike’s throttle. It’s hard to describe just how silent this bike is. Tesla’s and even electric milk floats have pretty silent engines, but they still create a little bit of ambient noise from the contact their four tyres make with the road, and the amount of air their bulky bodies displace. The Super Soco, in comparison, has just two wheels, and barely displaces any air. It is, in other words, completely silent. You don’t drive it as much as you glide while riding it, drifting through the streets with little more than your hi-vis gear to alert other road users to your presence. On my first ride, this fact terrified me. Usually you can rely on some slight engine noise to alert other road users to your presence, but on a silent bike you have to rely entirely on being seen. This means you’ll want to ride carefully, and as I slowly made my way across London from the TechRadar offices I stuck religiously to the center of each lane, and avoided filtering between traffic. Riding like this meant that I made slower progress than usual, but otherwise the bike wasn’t any slower than my usual scooter in London’s stop-and-go traffic. But when I got down into the suburbs the speed limitations of the bike started to become more obvious. By default, the bike’s top speed is limited to 30mph, which means that it’s fine on most residential streets, but you’ll struggle to keep up with traffic on faster roads. On my various rides I found exactly this. In traffic and residential streets the bike nipped along happily, but as soon as I found myself with an open road stretching out in front, a queue of traffic quickly formed behind me, pushing me to go faster than the bike was able to. Whether this ends up being an issue for you will depend entirely on what sort of traffic your usual commute consists of. I found the bike presented no issues on my ride between two fairly central locations, but if you commute from slightly further out of a city center then you might have more trouble. The Super Soco was a fun bike to ride. Its acceleration was impressive, it’s range was able to handle the biggest single journey I make on a regular basis (the 25 mile round trip to my parents’), and the removable battery makes it easy to charge. It’s stiff suspension meant that longer rides ended up feeling uncomfortable, and the build quality definitely tends towards the budget end of the spectrum, but for just over £2,000 (around $2,600, AU$3,200) these feel like trade-offs worth making. But the main problem with the Super Soco, and indeed all electric motorbikes, is that I don’t think the economics of them quite make sense. The issue is that scooters are already very fuel efficient. My Vespa is advertised as getting 110 miles per gallon, and in reality that means that I fill it up with petrol every couple of weeks for just under £10. The costs of running a bike, however, amount to far more than fuel. You need to have insurance, you need to have road tax, and you need to, in the UK at least, pay every year to have it certified as being road legal. You also need to hold a valid license. Now, granted, in many countries you don’t have to pay road tax if your car is electric, but insurance costs alone can be substantial, especially for younger drivers. Ultimately what this means is that in order to drive an electric motorbike you’re still going to be paying substantial running costs, and for this you’ll get a vehicle that’s not able to travel outside of the city like a traditional motorbike. The fact is that there is already an environmentally friendly method of transport that exists without these drawbacks. That method of transport is of course the electric bicycle. Sure, it won’t go quite as fast as Super Soco’s 30mph, but the legal regulations on them are minimal, you don’t have to wear any safety gear, and you’re free to ride in both bike lanes and bus lanes (again, I’m talking about London here, regulations may vary elsewhere). You also don’t need to hold any form of license. The environmental appeal of an electric motorbike is obvious, but given the choice I’d be more likely to save myself the hassle and opt for a similarly priced electric bicycle. Sure, it won’t quite have the same range or speed, but over shorter distances and through heavy traffic it should make better progress as you take advantage of the increasing prevalence of bicycle lanes around the world. That said, for its intended purpose the Super Soco did an admirable job. It was a joy to ride, completely silent, and convenient to charge. I just don’t know if the category as a whole is good enough to take over from traditional forms of transportation. 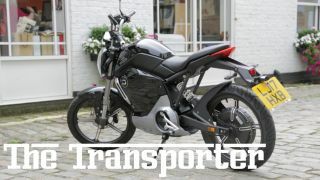 Normal motorbikes are able to do inter-city travel as well as inner-city commuting, but with its speed limitations the Super Soco is only equipped to deal with the latter. What electric motorbikes need is their Tesla moment, and as much as I hate to say it I don’t think Super Soco are quite there yet. *Super Soco claim a range of between 30 and 40 miles, but we found its range was closer to 25 when ridden in real world conditions without making too much effort to drive efficiently.